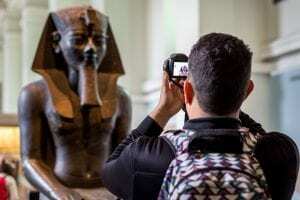 Located on Great Russell Street in central London, the British Museum is dedicated to preserving the collections of artefacts which represent the cultures of the world. Popular exhibits in times past have included ‘Ice Age Art’ and ‘Indigenous Australia: enduring civilisations’. Special exhibitions take place throughout the year with daily gallery tours and guided tours available to the public. Entrance to the museum is free of charge. Walk 1 minute to Aldgate East Station, take the District line towards Ealing Broadway, and get off at Embankment. Take the Northern line from Embankment St towards High Barnet via Charing cross and get off the train at Tottenham Court Road. Walk for 6 minutes North towards Great Russel St.